although I am sure most of you read the wealth of very sound material Richard publishes, particularly as a result of the permanent link on www.InfoWebSite.UK see either the >WEBSITES – ALL< or >POLITICS etc.< Pages, where you will find other usefull links. I have reposted this article as I feel it is important those with a true interest in Britain’s future wellbeing and success of #BreXit should not miss it. 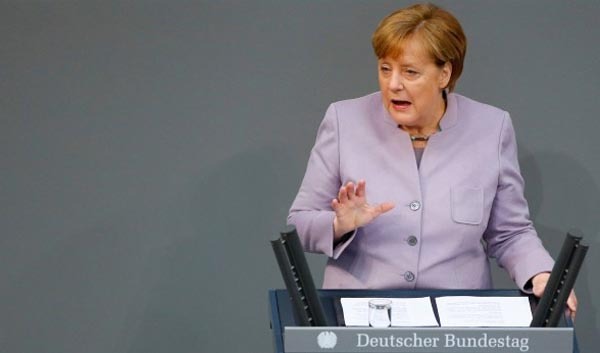 Remarkably, although it was strongly featured in the English media, Merkel’s address to the Bundestag on Brexit was harder to find in the German online media sites. But at least, when it came down to it, The Times and de Welt had roughly the same headlines, the former: “Britain is wasting time with Brexit delusions, Merkel warns” and the latter: “‘Wasted Time’ – Merkel warns Britons of illusions”. The Frankfurter Allgemein Zeitung (FAZ) also picks up the theme of “illusions”, and with brutal accuracy conveys Merkel’s message that, on leaving EU, “Britain would have the status of a third country” – part of her address which drew applause from the deputies. This is something we have been saying for a long time but there are an awful lot of people seem to have difficulties understanding it. Yet, because of that, says Merkel, Britain will not have the same rights as a member of the Union, or even be better placed. This is actually a matter of course, but “some in the UK”, she says, “apparently still had illusions”. And with absolutely concessions to their finer sensibilities, tells them that this is “wasted time”. The Guardian, however, transforms “some in the UK” to “British politicians”, which is not what Merkel said. This is not just confined to the politicians – a significant number of others harbour the illusion. Coming as it does just days before the European Council, this blunt speaking comes as a welcome corrective to the morass of stupidity that has been poisoning the Brexit debate. Merkel has told it as it is, and there’s no going back: “third country status” here we come. As to the forthcoming negotiations, according to FAZ, Merkel also took the opportunity to announce a hard line. The Federal Government, she says, has three concerns. Firstly, there is the fate of 100,000 Germans living in the UK, whose interests must be protected. Secondly, damage to the European Union arising from a change of a Member State to a third country must be averted. And thirdly, it is necessary to strengthen the cohesion of the remaining 27 EU Member States. Already, she says, talks over the past few weeks have shown that the European Council will “have a strong signal of unity”. The guidelines are the basis for the negotiating mandate for the Commission, she adds. “We are aware of the scale of the task, but we are also well prepared”. Then, in what amounts for bad news for Mrs May but is nevertheless entirely predictable, Merkel says that the question of UK financial commitments to the EU must be discussed at an “early stage” and placed at the centre of the talks. It made “no sense” to negotiate a future UK-EU relationship without agreement on the UK’s financial commitment to the EU, which has to “extend into the period after Britain’s exit”. The conditions of exit had to be clarified before all other aspects, establishing “legal certainty” as to the (economic) consequences of the withdrawal. Only then, she said, could the future relationship between the EU and Great Britain be discussed. And this order was “irreversible”. She rejected out of hand parallel negotiations on trade. Thus do we see the German Chancellor set out the framework for the Article 50 and is unlikely that this is going to change. It is, in effect, “irreversible”. And Mrs Merkel is absolutely right is saying that time has been wasted. The Guardian avers that her address was a “stern rebuke” for Britain, which had been hoping there was some ambiguity in the EU position on whether trade talks could run in parallel with negotiations on separation terms before a financial settlement. Yet just minutes before she spoke, the idiot savant Johnson was being pressed in a BBC interview about whether trade would have to wait until the divorce bill was settled. “We’ll see”, he responded, demonstrating his usual lack of grip on reality, the same lack that had him defending Vote Leave’s absurd £350 million a week claim. But if Johnson insists on inhabiting his fantasy world, this is not so easily open to Mrs May. For her, Merkel’s intervention should be a wake-up call – it is certainly one which she can’t afford to ignore. Should she even try, she will get a stark reminder over the weekend when the European Council publishes its approved negotiation guidelines. If there was any sense to this debate, this would be a galvanising moment. One which set the general election campaign on fire. Angela Merkel has set the agenda – Mrs May and the other protagonists must respond and they’re all running out options. No matter what any of them have said in the past, or is being suggested, a new elected government must have clear objectives. Firstly, it must come up with a rational plan to deal with the EU’s financial expectations and matters related to the conclusion of an Article 50 agreement. This will include settling the status of nationals of EU Member States currently resident in the United Kingdom. Secondly, it will have to abandon any idea of pursuing a free trade agreement with the EU in the near future. This is not an immediate option. Instead, the government will have to concentrate its resources on defining a workable transitional agreement. This will be the absolute priority and it is pointless trying to evade it. Even at this stage, it is still possible to go for the Efta/EEA option, which would vastly simplify the administrative problems in constructing the necessary secession treaty. But this cannot happen unless the parties focus. Otherwise, we could find ourselves sliding into disaster, without being able to influence events. And to that extent we are back where we started, confronting the reality of that which was always going to be – the pursuit of an interim agreement that will buy us time for a long-term solution. Sadly, though, it does not seem likely that any of the parties are prepared to approach Brexit with this degree of clarity, preferring instead their own fantasies. This, we already see with the CBI which, bizarrely, is calling for the EU should to “stop squeezing UK for [a] ‘divorce settlement’ and focus on trade deal”. This desperate air of unreality flies in the face of everything that we know and have learned of the EU’s approach to the negotiations. But, at least, Mrs Merkel has done us the favour of setting out the battle lines, and given us fair warning of what is expected of us. Too much time has been wasted already: we ignore what Mrs Merkel tells us at our peril.